During the first year and a half after Calvin’s epilepsy diagnosis we found ourselves—miserably—in the hospital at least a dozen times. I’d call the ambulance, they’d rush him to the emergency room of our local hospital, and he’d be transferred via a special pediatric transport team to the Maine Medical Center in Portland, thirty minutes from our home. There he’d be admitted to the pediatric intensive care unit (PICU) where we’d stay for up to three days. All this because of something called status epilepticus. Status, for short, is a serious, life-threatening prolonged seizure, or series of seizures. In Calvin’s case, he’d have eight to ten seizures in a row. Every forty-five minutes he’d wake to a seizure then fall back to sleep only for it to happen again and again. After that many seizures he’d go into a tonic-clonic (grand mal) convulsive seizure that would last twenty minutes or more. Once he had a forty-five minute seizure that we feared would take his life. I was literally kissing him good-bye when he finally came out of it. The longer a seizure goes the harder it is to stop and it will eventually cause brain damage and failure of the vital organs. It’s as simple—and devastating—as that. On a repeated stay in the PICU I recall a doctor about our age, perhaps a few years older, whom I’d seen there on previous occasions. He wasn’t too tall, had longish, curly hair that was stylishly messy and a handsome layer of facial stubble. He looked like the kind of doc you see on those prime-time hospital television series. 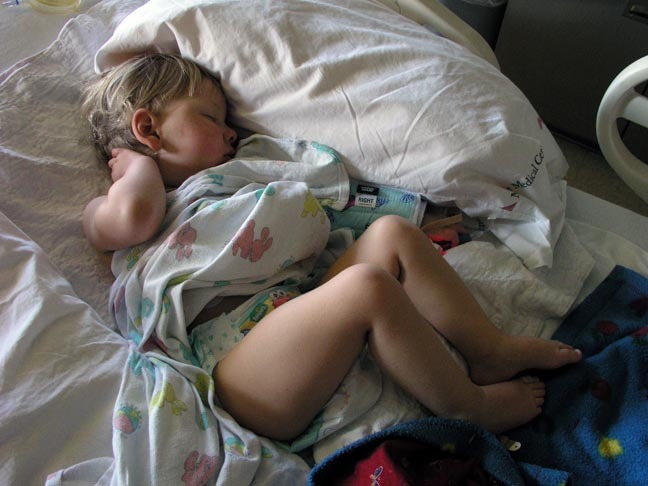 The doc loitered around the PICU wearing jeans, a plaid shirt and a fleece vest, then rolled open the glass door to Calvin’s room and stepped in. “I’d like to have a talk with the two of you,” he said in a southern accent, like Matthew McConaughey, who he kind of resembled. “Have a seat,” he continued. “I prefer to stand,” I replied. He insisted I sit. I didn’t, because there was a hint of condescension in that smooth southern drawl and I wasn't going to let him look down on me, too. I was his equal and he needed to know that. Regrettably, in the following months we landed in the PICU several more times and though we got glimpses of that same doc, he never approached us again. That was just fine by me. It has been over four years since Calvin has been admitted to the hospital for seizures. We hope to never find ourselves there again, though until his seizures are controlled, the risk, the uncertainty and the fear, will never go away. We used to be at the hospital with Sophie a lot when she was much younger, and over the years I've realized that our "tolerance" for her seizures was greater than our tolerance for the hospital. Although never in a life-threatening status, she certainly has had her share of Diastat, and I can honestly say that I'VE NEVER GOTTEN USED TO IT.